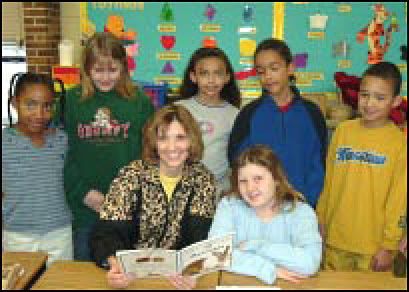 Tonya Dexter, third grade bilingual teacher, reads a story to a group of her students. There is a specific set of social skills that children need in order to be successful academically and socially. Knowing the children we teach individually, culturally, and developmentally is as important as knowing the content we teach. Knowing the families of the children we teach is important to knowing the children. How we, the adults at school, work together is as important as our individual competence. While our journey with RC continues to evolve, for the purposes of this paper we will be focusing solely on the first component, �Morning Meeting,� and how it has become a vehicle for us to enhance language instruction in the immersion classroom. Our initial curiosity about RC centered around the �Morning Meeting� (MM) as a vehicle for building community in the classroom and strengthening relationships. Research is now backing up what we�ve noticed as educators, that ��social skills� are inextricably intertwined with cognitive growth and intellectual progress� (Kriete, 2003, p 8). The MM provides a time and space on a daily basis for practicing those important social skills. The meeting format includes four components: a greeting, time for sharing, a group activity (game, song, etc. ), and �News and Announcements� about the academic day ahead. All of this takes approximately 20 minutes. As immersion educators, we are perhaps doubly inclined to ask, Where do we find the time, how can we add one more thing? In the case of immersion education, however, the time and space created to talk, question, listen and hear others during MM provides many opportunities for the authentic use of the immersion language, and also offers children the chance to belong, to feel cared about and to have fun using their immersion language. As a result of our experience in immersion education through .the years, we have noticed that children learn best when language learning involves them in interesting, meaningful and real tasks, and when their desire to communicate accurately is intensified by issues of self-interest and a genuine motive�having their personal meaning understood. Children learn language best through purposeful interaction, and the more frequently a child enjoys opportunities to speak, read, write, and listen to the language, the more she/he is able to produce. These skills are vital to all learners, and especially to immersion learners, who must be provided with multiple opportunities for refining their language production. There are four purposes for the first component of MM, the greeting. The second component of MM is sharing. In the immersion classroom, sharing provides rich opportunity for focusing on different aspects of language. While children are sharing and asking questions of one another, the teacher is continuously assessing their use of language. This assessment then becomes the basis for future language instruction, in the form of mini-lessons, or by having students focus their attention on a particular grammatical structure during subsequent meetings. For example, if students are consistently using incorrect verb endings for questions and replies, this becomes a mini-lesson, and in subsequent meetings students are asked to focus on their usage. The same can be done with the usage (or lack thereof) of common phrases and expressions in the immersion language. These aims are in line with the strategies set forth by Miriam Stein, Ph.D., in the May, 1999 ACIE Newsletter which included: 1) Perform a needs analysis, 2) Familiarize yourself with the linguistic structures in the target language, 3) Encourage use of non-academic vocabulary in your classroom, 4) Encourage more oral production in your classroom, and 5) Encourage accurate oral production. While this sharing is taking place, it is not uncommon to hear students correcting each other, or supplying each other with unknown words. Another helpful strategy we like to use is to post common questions and answer phrases in the meeting area, (e.g., �Have a good time,� �Who gave it to you?,� �Where did you get it?,� etc.) to further focus student attention on correct usage of L2. Use of common expressions and phrases at the primary level (�I like�,� �My favorite ___ is�,� �I went�,� etc.). Questions that require adjective/noun agreement. Questions that require subject/verb agreement. Questions that require the use of difficult verb constructions (the verb �to like/me gusta� in Spanish; reflexive verbs, etc.). The use of the subjunctive and conditional tenses (If I had a million dollars, I would�, If I could be any animal, I would be�, etc.). The final component of MM is �News and Announcements.� This aspect is a written communication from the teacher that outlines the academic day ahead, and may summarize prior learning, or acknowledge students for something they have accomplished. The writing, often in the form of a letter, is also interactive in that it involves students in answering some question or prompt related to the academic day ahead; it serves as a preview to learning. This interactive piece can also serve as a natural assessment of language development, in that the question or prompt can focus on grammar skills, math vocabulary, vocabulary from themes of study, and so on. Language growth possibilities in the immersion setting are endless. In the primary immersion environment, �News and Announcements� follow a regular, predictable format to build reading skills. It is also a great means of building and using familiar language patterns to teach letter recognition, phonics skills, spelling, vocabulary, basic phrases, etc. Primary teachers also focus on including new sentence patterns to continue building independent reading of unfamiliar language. �Work the chart��specific grammatical focus where students may identify parts of speech, change verb tenses, add missing words (articles, verb endings, adjective endings, etc. ), create a list of synonyms for overly used words, etc. While there will always be a struggle for time in the immersion classroom, we have come to value the important learning that takes place during the first minutes of every school day, both socially and academically. The language and friendship that is established during greetings, the conversations that take place during sharing, the fun and cultural learning that take place during the activity portion of MM, and the rich language opportunities provided through the use of the written word, all provide the basis for increased language use and proficiency development in the immersion classroom. As research and experience have shown, students need to use the language in order to master it. ��There are real limits to the level of second language proficiency that can be achieved in school settings that do not include a substantial opportunity for peer interaction in the target language� (Genesee, 1987, p. 77). Perhaps the greatest challenge facing immersion teachers is the art of creating a learning environment where students are motivated to stay in the immersion language. Our responsibility is to create conditions for learning through social interaction by providing students with engaging, meaningful and fun reasons to use their developing language skills. �Students must have opportunities to communicate powerfully in the target language if they are going to integrate their language and cognitive development with their growing personal identities" (Cummins, 2000, p.13). While our initial aim was to use MM to foster community in the classroom, which it certainly has, we have discovered along the way that it is a wonderful vehicle for motivating student use of the L2, while providing opportunities to acquire, practice and fine-tune their developing language skills. We have found that MM is worth the investment of time, both for community building and increased language proficiency in our immersion classrooms.